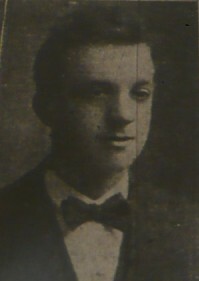 Son of John R. and Emily Waterworth, of 10, Walshaw Lane, Burnley. Born Burnley. Also fiancé to Mildred Heap of Granville Street, Harle Syke. Mildred later married Herbert Atkinson. The death from wounds is reported of Pte. Harry Waterworth (20), 203306, Royal Warwicks, only son of Mr. and Mrs. Waterworth, 10, Walshaw-lane, Burnley. He died on Sept. 9th. He joined the Army in May, 1916, and went on active service in November. In civil life he worked for the Walshaw Mill Co., Harle Syke, as a weaver. He was a Rechabite. An uncle, Pte. Harold Waterworth, is now in France. Relative to their son, Mr. and Mrs. Waterworth received a letter from the Rev. J. A. Townson, chaplain, on Sept. 8th, stating that he had been seriously woulnded in the stomach (penetrating the abdomen). Later they were informed that he succembed on Sept 9th.